My twin sister and I both have tetracycline stains from some medicine we took when we were young. She decided to get something done about them. I kind of wanted to wait until I saw how hers turned out. She went to her family dentist. He crowned all her upper teeth and whitened the bottom teeth. He told her the bottom teeth wouldn’t look exactly like the top because tetracycline stains are hard to whiten. We were prepared for that. The crowns took him a couple of tries before he got something my sister was happy with. Though she likes them, I’m not too thrilled with them. To me, they’re so opaque they look like the porcelain you’d find in a bathtub. Is there a way to get it more natural looking? Yes, I know it’s still better than my teeth, but I’m wondering if a different dentist could have done a better job. It takes an expert cosmetic dentist to treat tetracycline stains beautifully. It takes an expert cosmetic dentist to create a beautiful solution for tetracycline stains. Most cosmetic dentists don’t have the technical skill and artistry necessary. It is among the most challenging of cosmetic cases. Because the tetracycline stains show through tooth structure, both natural and manmade, most cosmetic dentists go too far the other way, as your sister’s dentist did. They make them so opaque to cover the brown of the stains, their teeth end up looking like bathroom porcelain. That doesn’t mean your case will have to turn out that way. In fact, I’m sad to say, those dentists who are highly skilled in their field spend a great deal of their time fixing subpar cosmetic procedures other dentists have done. We’ve had patients come to us from other offices in tears begging Dr. Malone to fix their smile. I’m curious as to why your sister’s dentist used crowns on all her teeth. Did she have issues on them which required crowns? I don’t understand why he’d remove so much tooth structure if her teeth were otherwise healthy. Generally, I’d use porcelain veneers to cover tetracycline stains. This only requires mild shaving on the front of the tooth. Even if there were a recognized specialty in cosmetic dentistry, every dentist’s skill level and artistic eye vary. How in the world is a patient to know if one cosmetic dentist is better than another? Would you even know what to ask if you had an opportunity to interview the dentist ahead of time? Of course not! This is exactly why the American Academy of Cosmetic Dentistry (AACD) formed. They wanted patients to have a resource where they could find expert cosmetic dentists. Any cosmetic dentist can join as a member, however, they have an accreditation program. If a dentist is AACD accredited, they’re in the top 1% of cosmetic dentists in the country. They’ve passed stringent exams, both oral and physical. They’ve also had to demonstrate their artistic ability by giving examples of a large number of specific cases they’ve personally performed. I’d go to their website and look up which AACD accredited dentists are near to your area. It’s worth it to travel just a little if you need to. I saw a post to Dr. Hall of mynewsmile.com where someone was complaining over the prices of cosmetic dentistry. Saying it was unfair to middle-class families who can’t afford such prices but still want beautiful smiles. Being in Louisiana, whose economy has suffered greatly after the hurricanes and oil spill we’ve suffered recently, I was interested in his response. Why is Cosmetic Dentistry so Pricey? The price generally depends on two things: the type of procedure you have done and the skill and artistry of the dentist who does it. For example, if you’re getting dental bonding done, it would cost considerably less than something like porcelain veneers. The materials are different and the results don’t last for as many years as the veneers. As far as the skill of the dentist is concerned, there are dentists who spend years in post-graduate training developing their artistic skill. They put equal time and detail work into creating the most beautiful smile they can for your which takes up a significant amount of time they could have spent on other procedures. What Happens if You Go to a Cheaper Cosmetic Dentist? Every dentist works out their own pricing. But some, with less training and artistry, will lower their prices as a means of drawing patients in. You’ll get porcelain veneers alright, but they likely won’t be what you were expecting. There are many cosmetic dentistry horror stories by patients who had to go to a second dentist to get the work re-done because their “affordable dentist” gave them a disaster of a smile. Dr. Malone has had to fix quite a few patient’s smile makeovers who came to him in desperation after their dentist botched the work. What’s a Better Cosmetic Procedure: Crowns or Veneers? I want to improve my smile. I went to my dentist to discuss getting porcelain veneers. He said they’re not as good as everyone makes out and I’d get a better smile with porcelain crowns. I’m a little worried about that idea because I’d lose so much tooth structure. But, if they’re better I guess I should go for it. What do you think? If you want a gorgeous smile, what matters more than the material is the cosmetic dentist you have do the procedure. However, that being said, I can tell you right now your dentist isn’t the right one because of the material he’s trying to talk you into. Porcelain veneers are as good as they say…when the right dentist does it. Your dentist is probably suggesting crowns because he doesn’t have enough experience with porcelain veneers. He doesn’t want to admit that so he suggests a procedure he is good with, porcelain crowns. But, you’re right to be concerned. Why would you want to grind down perfectly healthy tooth structure? Porcelain veneers don’t do that. They only require mild tooth preparation. How Do You Choose a Cosmetic Dentist? The easiest way to choose a cosmetic dentist is through the American Academy of Cosmetic Dentistry (AACD). They have an accreditation program. Dentists who reach accreditation level are among the top cosmetic dentists in the world. They have to pass stringent oral and written exams as well as demonstrate their artistic abilities and quite a few cases they’ve done on patients. They’ll certainly give you a gorgeous smile. In fact, most of them have a beautiful smile guarantee. What if there’s not an accredited dentist near you? Not having someone who’s reached accreditation level in your area doesn’t mean you can find a highly skilled cosmetic dentist. Some dentists are in the process are obtaining accreditation but already give gorgeous smiles. I’d check the mynewsmile.com website. They recommend highly skilled and artistic cosmetic dentists only some of which have already passed the accreditation exams. Is There a Poor Man’s Smile Makeover? I’ve been waiting for years for my financial situation to change so I could get a smile makeover. Sadly, I’ve come to the conclusion it’s not going to change anytime soon and I’m really tired of hating my smile. I can’t afford porcelain veneers. But, hoped there’s such a thing as a poor man’s smile makeover. There are several things you can do to improve your smile on a budget. Which procedures you do, depends on what bother’s you about your smile. If it’s just the color, teeth whitening can totally remake your smile affordably all while taking years off your appearance. It can be done in one appointment at your dentist’s office or over a period of time at home with custom made whitening trays from your dentist. If you have minor chips or gaps, you can have dental bonding done to repair them. Of course, if changing the whiteness of your teeth is still in the picture, you’ll want to do that first. The color of the bonding can’t be changed once it’s completed, so you’ll want to match it to already whitened teeth. Another option is Invisalign. It’s a way to orthodontically straighten teeth without using traditional metal braces. It can be done without anyone knowing you’re doing it. A bonus feature is the aligners used for Invisalign can double as whitening trays, so you can straighten and color your teeth simultaneously, saving you additional money. Invisalign and whitening can be done by just about any dentist. Dental bonding, however, requires a cosmetic dentist with some artistic ability. It’s done freehand and your teeth change in depth and translucency as you move down the tooth. If your financial situation ever changes and you want a blow out the room type of smile makeover, then you’d get porcelain veneers. I’m in a quandary. My entire top arch is made up of crowns. Don’t ask. Long story. They’re about ten years old. I noticed one of the very front crowns is wiggly. I went to see a dentist. He said the crown needs to be replaced, but in order to get the new crown to match, they’d have to all be replaced. Do you realize how many crowns that is? In order to match one crown, I’d have to practically mortgage my house. What the heck? I was never told they’d all have to be replaced if one went bad when I first got them. Is there any other option? I don’t want to go so far in debt, but it’s a front tooth so I do want it to match. Help me. This is just a guess, but I can pretty much guarantee it’s a correct one. Your dentist is a decent family dentist, but not one who has excellent cosmetic skills. A good cosmetic dentist can match a single crown to the rest of your teeth. This one can’t, so instead, he wants you to spend a small fortune replacing all of them so he can make them all exactly the same. You need a different dentist. An expert cosmetic dentist. It’s hard for patients to know which dentists are skilled and artistic with cosmetics and which aren’t. One of the reasons for that is there isn’t actually a recognized specialty from the ADA in cosmetic dentistry, so any general dentist can call themselves a cosmetic dentist no matter how unskilled they are. Fortunately, the American Academy of Cosmetic Dentistry realized how difficult this is for patients. They started an accreditation program for dentists so there would be some way to distinguish those dentists who put the effort into learning the skills and artistry required to create beautiful smiles. In your case, instead of mortgaging your house, I’d find an AACD accredited dentist and have them match your single crown to the rest of your teeth. You can still go to your regular dentist for other things if you want, but I’m concerned that he cares more about saving his “reputation” than how much money he costs you. Zoom or Take Home Whitening? I’m getting my teeth whitened, but am trying to decide between Zoom Whitening and Take-Home Whitening. Will I need a cosmetic dentist or can my family dentist to it? I’ll answer your second question first. Any dentist can do teeth whitening. It’s a fairly simple procedure. If you were getting something like porcelain veneers, then you would definitely want a dentist with cosmetic training. However, if your family dentist doesn’t have a Zoom Whitening System, then you’re down to one option. Not every dentist invests in one. As to which procedure, that depends on your goals. If you’re wanting your teeth as white as they can be as quickly as possible, Zoom is your best option. On the other hand, if you want more control over the level of whiteness or want to do it gradually, then take-home teeth whitening is a better fit for you. Either way, you’ll get beautiful, white teeth. Can I Improve My Smile Without Tons of Money? I’ve wanted to improve my smile for a long time, but just don’t have that much money. I’ve heard porcelain veneers are the way to go, but when I looked into them they were way too expensive. Is there a less expensive way to makeover your smile? It’s a tough economy right now, especially where we are in Louisiana, so I understand wanting to save money. It’s tough when you have a desire to improve something, but don’t feel you have the requisite funds. I have some good news for you though. There are cosmetic procedures you can do that will improve your smile without porcelain veneers. One of the least expensive cosmetic procedures is teeth whitening. That simple procedure takes years off your appearance. If you can swing in-office whitening, it’s faster. Your teeth will be dramatically whiter in one appointment. However, your dentist can custom design trays for you to do professional strength whitening at home. That costs a little less. It will take a little longer, depending on the level of whitening you desire, but it can get them as white as the in-office option. If you have chips or gaps in your teeth, dental bonding can repair them, and is significantly cheaper than veneers. Just be aware that while veneers can last a couple of decades when well cared for, dental bonding will only really last a few years. Can I Close My Tooth Gap Without Invisalign? I wanted to close a tooth gap. I wanted to do it with cosmetic dentistry, but my dentist wants to do orthodontics. Isn’t there a cosmetic way to do it? Yes, there are a couple of cosmetic options to close a tooth gap without orthodontics. Two cosmetic options are dental bonding and porcelain veneers. Dental bonding is the most logical if all you want to do is close the gap. 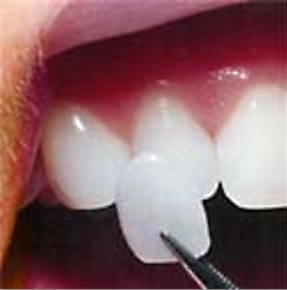 A cosmetic dentist will use a composite resin to fill in the tooth gap. Porcelain veneers are a bit of an overtreatment for simply closing a tooth gap. But, if you had several changes you wanted to change about your smile, such as the shape, size, and color it would make more sense. However, let me give you a small word of caution. If your dentist didn’t suggest either of those, it’s likely because he’s not confident in cosmetic procedures. You’ll want to find a skilled cosmetic dentist.